Fans attending gigs on the forthcoming Ferocious Dog tour will be taking spare food and clothes with them – to help the homeless. 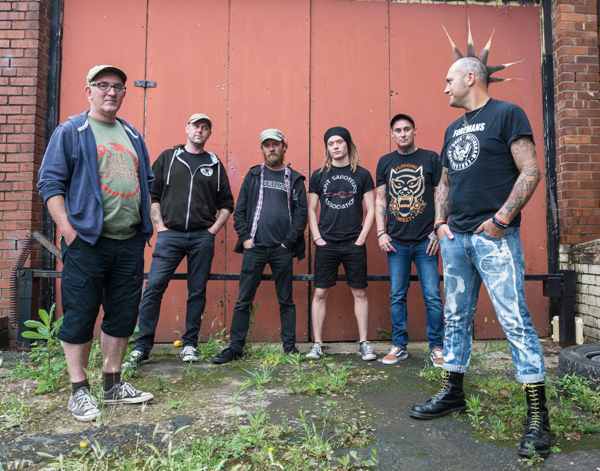 The six-piece folk-punk band from Warsop in Nottinghamshire will give the donations to charities and food banks. The 2018 tour kicks off on March 1 at The Tivoli in Buckley and concludes at Rock City, Nottingham, on April 28. The band play Birmingham's O2 Institute on March 8. The idea for the Food Drop came about following the suicide in 2012 of Lee Bonsall, the son of frontman Ken Bonsall. Lee was suffering with Post Traumatic Stress Disorder after serving with the military in Afghanistan. The Lee Bonsall Memorial Fund was set up, and Ken and his wife Karen, organised soup kitchens and helped the homeless. They discovered that many were ex-servicemen, living on the streets, so they requested donations of food and clothes from fans at Ferocious Dog gigs. The Food Drop now takes place at every show. ''After watching I Daniel Blake, which is a realistic depiction of life on benefits, it really pushed me on,'' said Ken. ''I felt we were missing a trick so decided to start in Glasgow, which is a deprived city, really struggling. We had a brilliant response. I phoned up homeless charities and food banks and they came to take the food away." During 2017 the band released their latest studio album, Red, and played slots at some of the UK's and Europe's favourite festivals, including the famous Colours of Ostrava festival in the Czech Republic. They ended the year with gigs in Spain, Belgium and Holland. Their music encompasses folk, infused with rock, reggae and Celtic vibrations. Behind frontman Ken are fiddle player Dan Booth and John Leonard who plays just about everything with strings, including five-string and tenor banjo, mandolin, guitars and bouzouki. Completing the line-up are former Carter USM guitarist Les Carter, bassist John Alexander and drummer Alex Smith. When Carter USM headlined Glastonbury's Pyramid Stage in 1992, Ken and Dan were in the audience... and now Les Carter is their band colleague. Dreams do come true! Apr 28: Rock City, Nottingham. When: Touring from March 1, 2018. In Birmingham on March 8. Thoughout this tour, as a Ferocious Dog fan I intend to do a charity hitch hike to all the gigs raising money for The Lee Bonsall Memorial Fund and raising awareness of PTSD and homelessness.